Does your steering wheel get too hot in the summer? Here's a perfect solution. 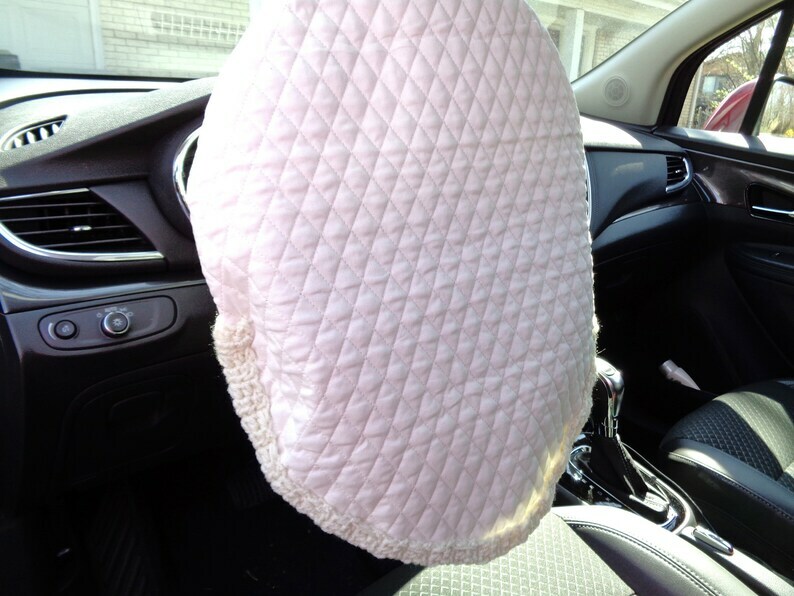 This quilted wheel cover is just perfect. One side is a circle and the other side is a half circle. Place the cover over your steering wheel when you get out of our car and when you come back just remove it and your steering wheel will be so much better to touch! If you live where it is really hot in the summer you can't keep all the heat out but it will certainly help. These covers have been sewn from quilted material. They are trimmed with a crocheted edging for a finished look. It is machine washable and can be dried in the dryer. The inside of the wheel cover is not finished, but no one should ever see it. It has been double sewn to keep it from coming apart. Just put it over your steering wheel when you get out of the car and take it off before driving. It will help keep your steering wheel cooler. Please note that in extreme heat, this material cannot keep a steering wheel completely cool. This would make a perfect gift for someone who has everything, but needs something for their hot steering wheel! This particular cover is made from a cream color cloth. Please take a moment to check out my crochet shop.